The Whale shark (Rhincodon Typus) has the distinction of being the Word’s Largest Fishing, reaching at least 60ft/18m in length. The largest confirmed confirmed whale shark measure a whopping 41.50 ft/12.65m and weight more than 21.5 tonnes, and there are unconfirmed of considerable larger whale sharks seen. The name “whale shark” comes from the fish’s physiology, being as large as many whales and also a filter feeder like many whale species. Whale sharks are found throughout the tropics and in the territorial waters of over 120 counters, and have thought to have inhabited the Earth’s Oceans for more than 200 million years. Recording sighting of these majestic creatures date all the way back to the Mayas of Mexico’s Yucatan Peninsula. Until recently, they have been feared due to their immense size and the general misconception of all sharks being man-eaters. But, they are one of only three specie of sharks that are filter feeders (along with the Basking Shark and the Megamouth shark). Whale Shark eat a variety of tiny animals including zoo-plankton, jellyfish, small bait fish, fish eggs and squids. They feed by filtering large amounts of water across their gills while swimming or by gulping water and filtering food in a stationary position (the only filter feeding shark known to do this). Like Many sharks, whale sharks grow slowly, mature late in life, and live long lives. Scientists believe whale sharks live 100 years or more. Males appear to reach sexual maturity at lengths of 25-30 ft / 7.5 – 9m, or approximately 25 to 30 years old. The young sharks, called pups, develop in egg-cases in the female’s uterus and then are born live. Despite its size, the whale shark does not pose significant danger to humans. Younger whale sharks are actually quite gentle and can play with divers. In Belize, whale shark sometimes mistakes the bubble from dives as fishes, and are often seen gulping the divers bubbles like in this Youtube Video. Known as a deity in a Vietnamese culture, the whale shark is called “Ca Ong”, which literally translates as “Sir Fish”. In Mexico, and throughout much of Latin America, the whale shark is known as “pez dama” or “domino” for its distinctive patterns of spots. However, they go by “Sapodillo Tom” in Belize due to a man name Tom who reported sightings of these huge fish at the Sapadilla Cayes. In Africa, the names for the whale shark are very evocative: “papa shillingi” in Kenya came from the myth that God threw shillings upon the shark which are now its spots. In Madagascar the name is “marokintana” meaning “many stars”. Javanese also reference the stars by calling it “geger lintang,” meaning “stars in the back”. In the Philippines, it is called “butanding” and “balilan” while in Madurese, it is known as “kikaki”. Because they grow and reproduce far more slowly than many fish species, whale sharks are very vulnerable to depletion through fishing, and scientist believe their numbers have been greatly reduced in areas where targeted fishing takes place. Yet whale sharks continue to be fished, primarily in the Asia-Pacific region to supply the Asian fin and meat markets. Although whale sharks are protected in several countries and are listed in the convention for Migratory Species and on Appendix II of the Convention on international Trade in endangered Species, which monitors and regulates trade in Whale Shark Products. However, whale sharks do not currently benefit from global management and protection. Tourism is a lucrative and potentially sustainable activity that can help to promote whale shark conservation. Most countries are realizing that whale sharks are worth far more alive through tourism than dead. consequently several countries, many with developing whale shark tourism, such as Mexico, India, Maldives, Honduras, Belize Australia, USA, Seychelles and the Philippines have passed national state or site specific laws protecting whale sharks. However, tourism can adversely affect whale sharks. Divers and snorkelers harassment can alter a whale shark’s behavior and boat collisions can maim or kill them. As a precaution several countries such as Belize, Philippines and Australia have related whale shark Tourism and in Belize Local Whale shark tour-guides have undergone training to promote safe and sustainable tours. 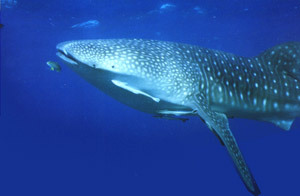 Whale Shark Conservation in Belize is head by S.E.A (You can visit there website here). You can also view Belize’s Whale Shark Rule and Regulators Here.